My first card for today is my card for the HMFMC. The theme is "In the Pink" and you are to use predominately pink on the card. Which is a challenge for me, since pink is a color I rarely use. I stamped my image and colored with copics, sticking mostly pink with a little bit of gray for the mice friends. The cardbase is a premade base from Michael's that I layered with some pattern paper and a doily. I added my colored panel to the top and to finish it I decided to add an awareness ribbon die cut and a button. I think it turned out pretty cute even if it is pink! Thanks for stopping by and have a fantastic day!!! Thank you for stepping out of your color comfort zone, Monica! I'm not a big pink girl either...but at this time of year, I make the exception! I really like your card (even if it is pink...hee hee hee). Thank you for your support for this challenge at HMFMC!! 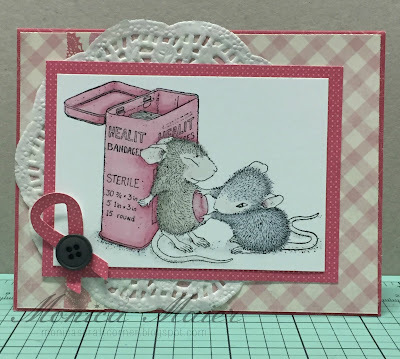 Hi Monica awww this sweet card hit the PINK theme perfectly..great image & design thanks for another cute mousey creation..
| gorgeous card Monica, a great design and super papers........I love the adorable cut image and fabulousdetails!! Awww, Monica, your card turned out so darling. Love the pink, and your coloring is wonderful. Nicely done. Great pink card! Love the pink bandaid. Cute card, I don't use a lot of pink either! Always find it when needed though! You did great with all the pink and that adorable stamped image! I rarely use pink either...but you aced it!